The predefined projects capability allows you to quickly access pre-configured project repositories. For example training labs or golden reference projects or projects that you commonly use. DVT looks for predefined projects in the directory indicated by the $DVT_PREDEFINED_PROJECTS system variable. In order to support directories spread on the disk, DVT also scans all directories indicated by any other system variable whose name starts with $DVT_PREDEFINED_PROJECTS_EXT_. For example, if you installed DVT from a distribution, by default $DVT_PREDEFINED_PROJECTS points to $DVT_HOME/predefined_projects. This is a project repository that you can use to explore the DVT features without the initial effort of configuring a project. At any time, if you wish to change the default location, you just need to point $DVT_PREDEFINED_PROJECTS to another location. 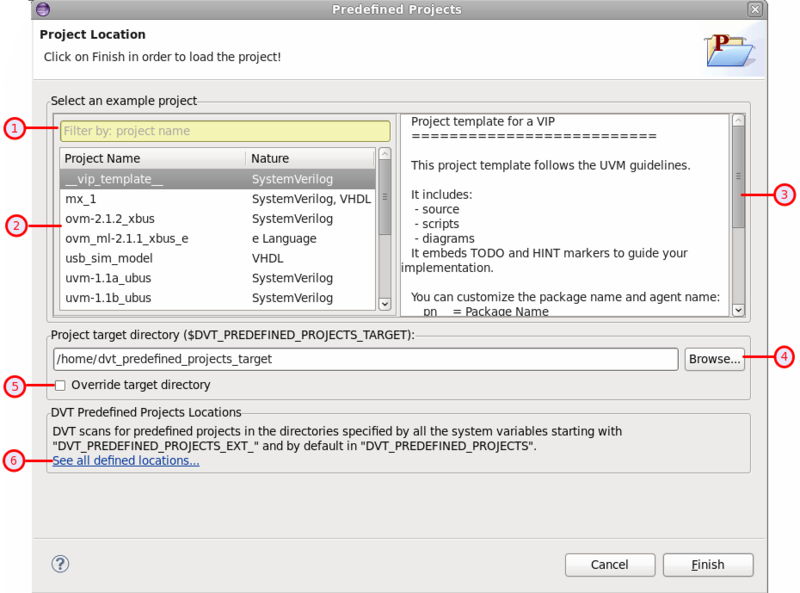 Or add another pre-configured projects repository by pointing $DVT_PREDEFINED_PROJECTS_EXT_MY_NEW_REPOSITORY to it. 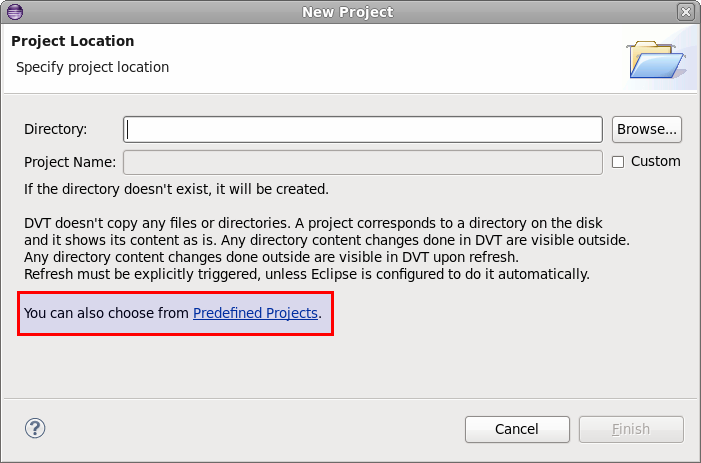 For example if you installed DVT as a plug-in on top of an existing Eclipse installation, $DVT_PREDEFINED_PROJECTS is unset. But you can download the predefined projects separately, and point the system variable to the folder where you extracted the predefined projects. To open a predefined project use the Predefined Project Wizard by selecting File > New > Example... then DVT Examples > DVT Predefined Project. If all the settings are correct, click Finish.